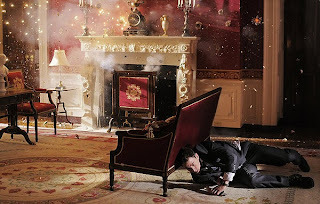 The rank similarities between White House Down and the Olympus Has Fallen, just released three months ago to tepid reaction, are obvious and regrettable. Both involve terrorist assaults on the presidential residence, kidnapping the Commander in Chief, a turncoat Secret Service agent, attempts to co-opt the nuclear launch codes, and so on. This time around, Capitol cop John Cale (Channing Tatum) is a decorated war hero with a messy personal life hoping to land a job on the President’s Secret Service detail, headed by the retiring Martin Walker (James Woods, his casting alone an obvious bit of foreshadowing). 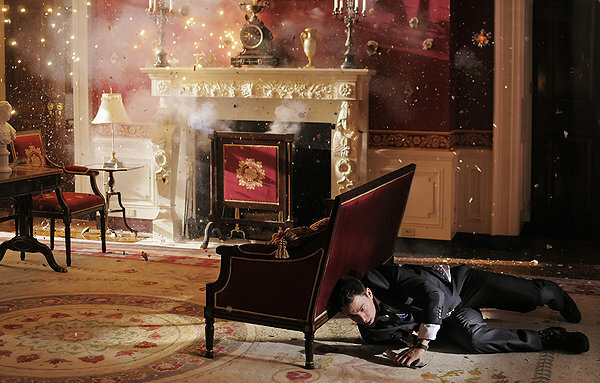 After an unsuccessful interview with old flame (or something) Carol Finnerty (Maggie Gyllenhaal), Cale his precocious daughter Emily (Joey King) get caught mid-tour in an armed takeover of the White House by a band of paramilitary mercenaries aimed at kidnapping President James Sawyer (Jamie Foxx). Of course, it falls to Cale to save the president...the country...the world! After touring the White House last year, I actually found myself marveling at the meticulous set design. But, it’s the affable byplay between Tatum and Foxx carries the film, which works best when it’s not taking itself too seriously—a car chase around the White House lawn involving the presidential limo is the over-the-top highpoint. Sawyer chomping nervously on some Nicorette gum is a not-so-subtle allusion to President Obama’s cigarette habit. Still, it’s a bit uneasy when the notion of character development is an African-American president gravitating to high-end sneakers, an automatic rifle and a Cadi when things get real—”Get your hands off my Jordans!”, Sawyer yelps at a tenacious terrorist. Ultimately, one (or a half-dozen) too many implausible and hackneyed twists eventually bring the story an inevitable, wearisome end. The 137-minute running time is at least a half-hour too long, stacking on plot turns that aren’t logical or necessary. Among the bloat are a bevy of supporting characters that do little besides stand around looking inert or saying inept things. And once the gleeful goofiness dissipates, that more than anything brings White House Down down. Good review Neil. You can't quite take it too seriously, but you can still have a bunch of fun with it all and that's all that really matters here. Its comes in average category. The beginning is somewhat slow. Story was good. There were lots of loop-holes in screening. Might be more better. Not like other Hollywood hitz.